When we are looking for accurate and repeatable measurements, we often turn to the trusty story pole. Though, our story pole usually consists of just a scrap piece of wood that is either cut to the right length or has measurement markings drawn on it. After all, being able to use the scraps we already have on hand, is what makes the story pole great. But what if you are doing a lot of measuring, and you need something that is going to be able to handle the abuse that goes along with production work? 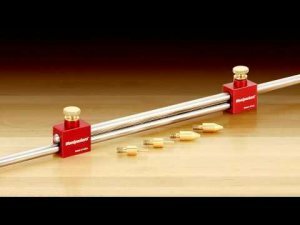 While I think most of us would be just fine with using a scrap wood story pole, Woodpeckers has a new telescoping Bar Gauge that can do everything a story pole can do, plus more. The Bar Gauge is made out of stainless steel, aluminum, and a bit of brass, so it should last you a lifetime. One of the coolest features is the special replaceable screw-on brass tips which allows the gauge to measure inside corners, or fit into dados. Woodpeckers is offering four sizes of Bar Gauges - 12", 24", 36" and 48" max lengths - priced between $29.99 - $44.99. The Bar Gauge are a special one-time-run, so you must order before Monday 11/7/11. They've been called offset sticks, story sticks, telescoping gauges and as we refer to them, bar gauges. Regardless how they're referred to, this measuring tool has no equal when it comes to accurately and easily determining an inside measurement. And yet they don't have a single scale marking.